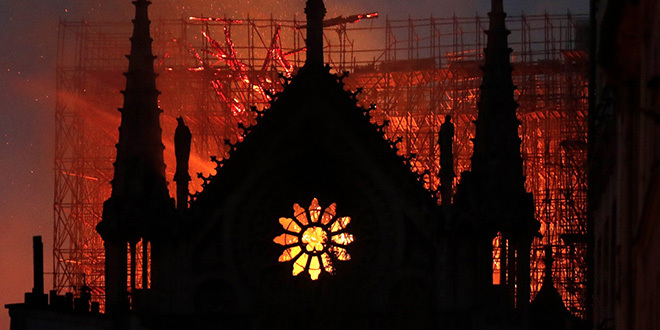 CATHOLICS across the world were united in sorrow and prayer after a devastating fire engulfed the Notre Dame Cathedral in Paris causing major damage. 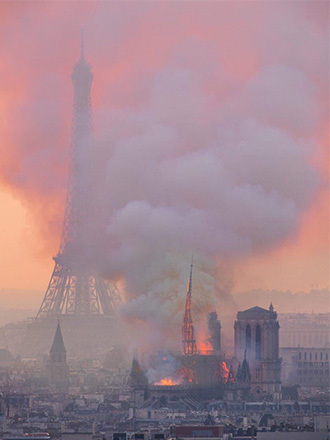 Images broadcast around the world showed the French cathedral in flames before collapsing shortly before 8pm local time. Officials now say that they the main bell towers and historic front of the building have been saved. The fire erupted at about 6.30pm local time. 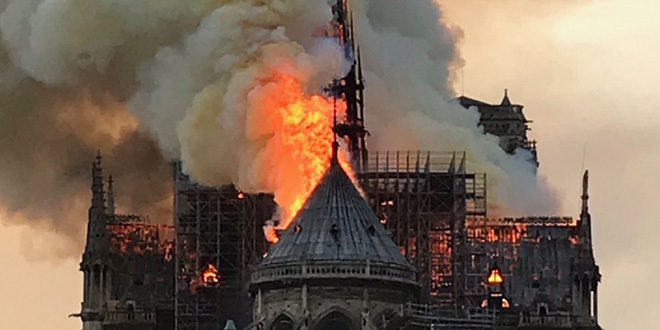 Authorities said the cause was not certain, but that it could be linked to renovation work that the cathedral was undergoing, the BBC reported. Brisbane Catholic Christian Pradayrol spoke of the heartbreak he had for his home country. “It’s devastating,” Mr Pradayrol, who lived in Paris for several years, said. “This one is such a monument and such a part of history that it is obviously heartbreaking. Amid the devastating fire taking place at the Cathedral of Notre Dame in Pairs, Daniel Cardinal DiNardo, Archbishop of Galveston-Houston and president of the US Conference of Catholic Bishops, issued a statement to the people of Paris. 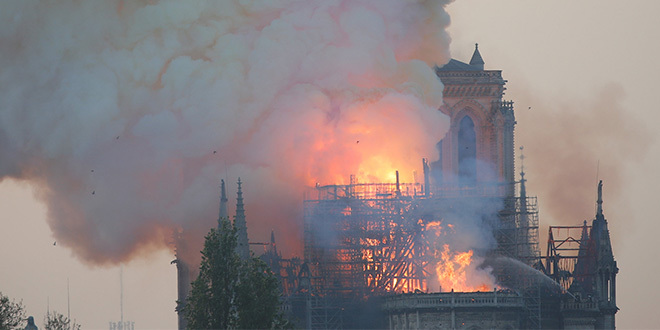 “The horrific fire that is engulfing the Cathedral of Notre-Dame de Paris is shocking and saddens us all, for this particular cathedral is not only a majestic Church, it is also a world treasure,” Archbishop DiNardo said. “Noble in architecture and art, it has long been a symbol of the transcendent human spirit as well as our longing for God. “Our hearts go out to the Archbishop and the people of Paris, and we pray for all the people of France, entrusting all to the prayers and intercession of the Mother of God, especially the fire fighters battling the fire. Los Angles auxiliary Bishop Robert Barron said he was “heartbroken”, and spoke of the strong spiritual connection he had with the Cathedral. “I can speak very personally. I spent three years in Paris doing my doctoral studies,” Bishop Barron said. “I lived about a 10-minute walk from Notre Dame – I used to give tours of the Cathedral every Wednesday. “I have a very profound spiritual connection to that place. Brisbane Archbishop Mark Coleridge expressed his sorrow via twitter this morning. “I wake to the news of the burning of #NotreDame and struggle to find words to express my horror,” he tweeted. The United Nation’s cultural agency UNESCO director general Audrey Azoulay said in a tweet her office “stood at France’s side to save and restore” the cathedral, which was added the organisation’s world heritage list in 1991. She said the cathedral was “a priceless heritage” and the agency was monitoring the effort to fight the blaze. New York Cardinal Timothy Dolan expressed his sadness and prayerful response to the devastating event. “I just went next door to our own beloved Cathedral, Saint Patricks, to ask the intercession of Notre Dame, our Lady, for the Cathedral at the heart of Paris, and of civilisation, now in flames. God preserve this splendid house of prayer, and protect those battling the blaze,” Cardinal Dolan tweeted.